Belgian corporate insolvencies are expected to decrease by 2% year-on-year in 2018 after an increase of 8.7% in 2017. 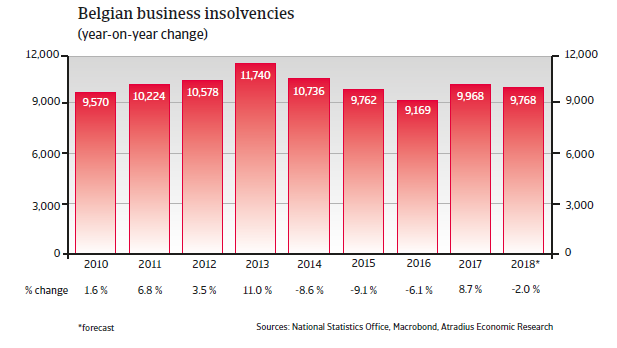 With about 9,750 cases forecast this year, the number of insolvencies will still be higher than the levels seen before the start of the global credit crisis in 2008 (about 7,700 cases in 2007). 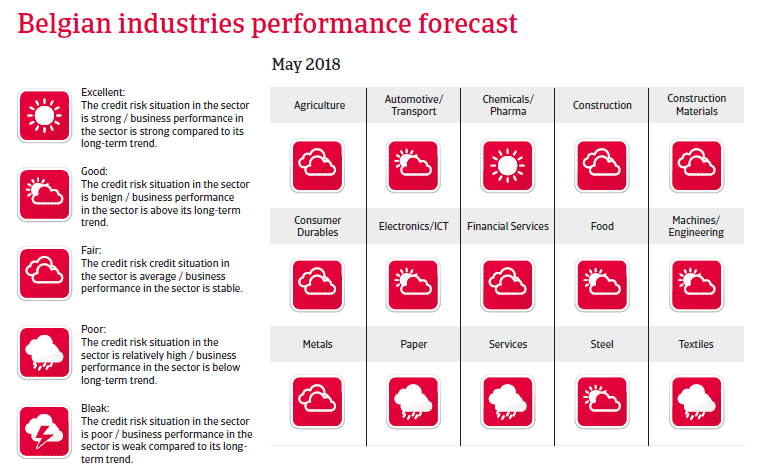 The Belgian economy grew 1.7% in 2017, as domestic demand was supported by increased business investment and higher household consumption, fuelled by increasing employment and wage growth. Inflation has increased to more than 2% in 2017, partly due to higher indirect taxes. In 2018 GDP is expected to increase again by 1.7%, still driven by domestic demand. Export growth is expected to slow down somewhat; competitive gains subside due to higher wages. Despite annual decreases, public debt remains high at more than 100% of GDP, one of the highest in the European Union in terms of the government debt-to-GDP ratio. Further fiscal consolidation seems to be necessary in the medium term. Improvements in business performance and credit risk seen in 2017 and the stable outlook for 2018 have led to a performance rating upgrade to “Fair”.